Founded by chocolate lover Diana, an entrepreneurial young mother with a passion for health and finest quality raw chocolate. 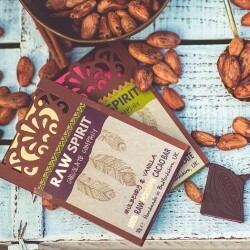 Raw Spirit produce their guilt-free chocolate under 42ºC which helps to retain the nutrients from the cacao, so that you can receive the maximum benefits. They take pride in hand moulding each bar then hand wrapping and sending them with love to your door. 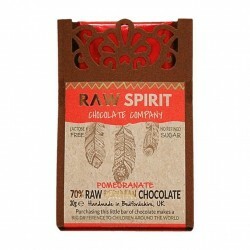 Raw Spirit use only organic, fair trade criollo cacao, sourced from 3 separate regions of Peru as they believe this mix gives the truest most unique flavour of real Peruvian criollo cacao. Criollo is the rarest sort of cacao on the planet which makes up only around 5% of the worlds cacao. 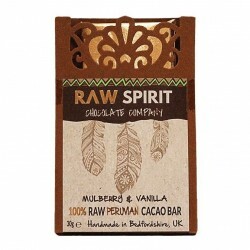 3% of Raw Spirit's profit is donated to UNICEF, as they are as passionate about helping children around the world as they are about their chocolate. 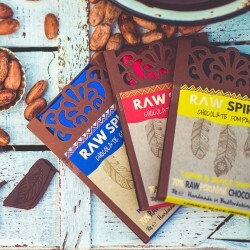 Their Earl Grey & Nibs and Pomegranate Raw Peruvian Chocolate Bars have won Bronze award from the Academy of Chocolate 2018 Awards.